The eternally fundamental Law of Life is Harmony. It is the foundation principle by which the formless comes into form and, as a condition of the manifestation of ideas into the world of experience, it is imperative. It is the activity of synthesis - building up , and even our physical senses crave it consciously and sub-consciously. Every human being is seeking happiness, and happiness is Harmony. There is nothing permanent without it. The place to start in any undertaking is to establish perfect Harmony in every person, thing, or condition concerned. If we are to manifest success and bring forth the perfect Divine Plan, this is essential. We must begin this establishment of Harmony within ourselves. Thus, we become the heart center or sun of the thing to be brought forth. We become the source of its creation and the center from which it is projected. The thought, maintained harmonious, will control the feelings, which are the realm of the sub-conscious. This is the realm within us which needs to be continually safeguarded against the impacts from the world without. The outside world makes its impressions upon the conscious mind through the thought and upon the sub-conscious mind through the feelings - which are controlled by the thought. When the thought is kept upon the Diamond Self, it automatically becomes harmonious, and controls and harmonizes the feeling. When this occurs the Super-Conscious Mind, or Diamond Self, unites Its Stream of Energy with that flowing through the sub-conscious mind or world of feeling and the two have become one. It is only when this condition is established and maintained that perfection in anything can be accomplished. Irritation, anger, hate, resentment, self-pity, jealousy, pride, selfishness, are the only failures there are in life. They are the only things that can make us resist Harmony and, therefore, make us fail in anything. What is sometimes termed poor judgment cannot exist in a harmonized mind. Attunement to the very Harmony itself, being the clear channel to the Diamond Self, will automatically call down the right idea - and the power and means of accomplishment - if the Harmony is maintained. When no feeling, of any kind except Harmony, flows out from us to and about any situation, person, condition, or thing, we can and will be masters of everything we contact; for Harmony is the instrument by which the Diamond Self rules all things. The Diamond Self automatically has the power to harmonize everything it contacts and anything unlike itself is but chaos and disintegrates by its own accord. The only power in the universe that can bring order out of confusion is the Diamond Self; for it takes the separated parts, assimilates them and puts them to work in their right positions and relationships. Therefore, the manifestation of the Divine Plan for anything depends first of all upon Harmony within. If we feel discordant about anything we can positively change our feelings by radiating Harmony into the thing or condition that disturbs. No condition can possibly stay with us one second after we refuse it any entrance into our feelings. If our feelings are kept harmonious, the conditions, persons and things we contact must become harmonious also; but, it is and always will be impossible to change the inside by changing the outside. The outer is but an expression of the inner; therefore the Law of Harmony must be obeyed and peace established within - and all things we contact will reflect Harmony in the exterior also. In all the sacred books in the world, we are told to put God first. Yet, we often hear people say, "I want to know more about the laws of life, but I must have enough income to take care of my physical wants before I can get my mind focused upon them." This is perhaps one of the most subtle arguments the human sides of us puts up. It is in the habit of demanding that its wants shall be listened to and supplied before it will let us have peace. Right here is the crucial point. If we would carry on with any degree of success from here we must take the scepter of power into our own hands and win. We can stand in the very center of darkness, confusion, and despair and, turning our thought upon the Diamond Self, begin to generate Harmony, which will flow out from us as do the rays of light from the sun. They will illuminate the darkness and bring about the manifestation of the perfect plan. It would be as impossible to draw from its stem the perfume that exists in the heart of the rose as to expect Harmony in the life, body, conditions or affairs of anyone who does not have it in his own thought and feelings first. The greatest problem in life is not the supplying of the physical wants, but the attaining and maintaining of Harmony of thought and feeling within ourselves regardless of any condition by which our physical selves are surrounded. We are not in physical form to accomplish mere comfort for the body: rather are we in the plane of human experience to manifest the full perfection of the Diamond Self on earth and to reveal its complete mastery over every plane on which it chooses to express Itself. After all the age-old admonition holds as true today as ever it did: "We have nothing to do to change any situation into perfection except change our thought and feelings about it." That is work which has to be done within ourselves and nowhere else. When we can harmonize our feelings about a condition, person, place or thing, one of two things always takes place: either the condition itself becomes harmonious or also it drops away altogether from our experience and we no longer contact it as a problem. Let us then when planning anything begin at the heart center, and tuning it true to the keynote of Harmony within our own thought and feelings, let the stream of Light and Energy pour into it from the Diamond Self. Then, through the thought of perfection, the feeling of joy, love and happiness, and the completed picture frequently held before our mental gaze, physical manifestation is a certainty. That which seems to be built in the world of form, and is not harmonious, will by its very imperfection disintegrate itself and the substance and energy of which it was composed will thus be released back into the Universal, and purified there to be used over again under the great Law of Economy by which the Architect of the Cosmos fashions systems of worlds. We as individuals are but atoms in the Great Cosmic Scheme observing ourselves from our human consciousness. Let us obey the law of Harmony within and without. When this obedience has become an established habit, the human part of us will begin to vibrato in perfect accord with the Diamond Self. We will then become aware of the fact that the Diamond Self is the Architect of the Cosmos, and that we can be conscious of everything in the universe through that Self. The atom will have expanded until it has become the universe and the universe will have explained the atom to itself. There is but one way to this realization. Harmony, which is also another name for Love, is that way and there is none other. This article by Edna Ballard is presented here as originally published in her privately printed newsletter from Chicago, The American Occultist, Volume 1, Number 12, August 1930. 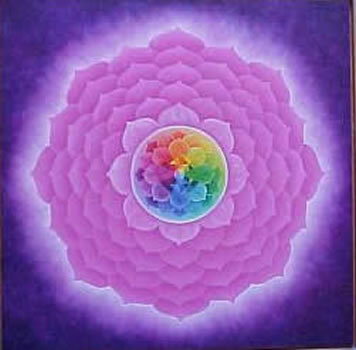 She gained Immortal Freedom in the Victory of the Ascension, reuniting with God's "I AM Presence" - the "Diamond Self", on February 12, 1971 - becoming the Ascended Lady Master Lotus.